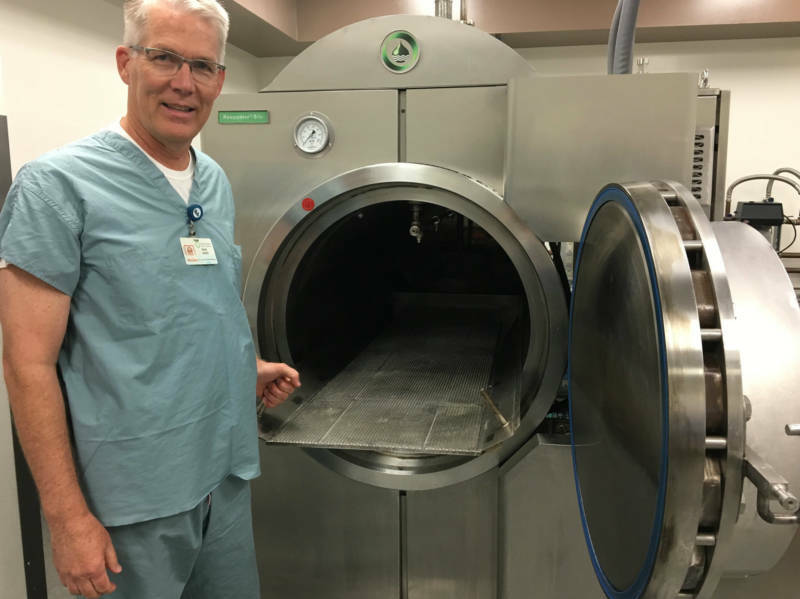 The method doesn't actually use water, but uses a chemical that speeds up decomposition of bodies and leaves behind only sterile water, bones, and medical implants or devices. The new law establishes procedures for licensing and regulating mortuaries or other companies that aim to adopt the method, to be overseen by the Cemetery and Funeral Bureau within the state Department of Consumer Affairs. Supporters say water cremation offers a green alternative to traditional cremation or burial. You may not equate death with climate change, but disposing of human remains leaves a fairly hefty carbon footprint. Plus, Doughty says, cemeteries monopolize land, an increasingly precious resource as the population grows. Hence the growing popularity of a green alternative, known as water cremation, bio-cremation or flameless cremation. Basically, the body is dissolved in a hot chemical bath, leaving a sterile solution that can be flushed down the drain. The carbon footprint of this process is just a quarter of traditional fire cremation because it uses so much less energy; and only a sixth of a burial because it doesn't require the materials for concrete headstones, mahogany caskets or the chemicals used in embalming. State lawmakers are considering a bill that would legalize water cremation. In the last decade, two previous efforts have failed, although the process has been approved in 14 other states, including neighboring Nevada. This year, a third attempt is gaining momentum in California, progressing further in the Legislature than the previous bills. There’s only one place in California where bodies are currently dissolved — legally, at least. That would be a chilly lab at UCLA, where cadavers that have outlived their usefulness at the medical school end up. The room smells a little like shellfish, which I think might be the smell of melted flesh. But the guy in charge, Dean Fisher, laughs at that notion. Potassium hydroxide is found in the Earth's crust — and in many household cleaning products. It's the same chemical that breaks down or composts organic matter in dirt. That heat is applied inside a shiny stainless-steel chamber, about the size of a large van. The front of the machine has a circular hatch, modeled after a submarine door. 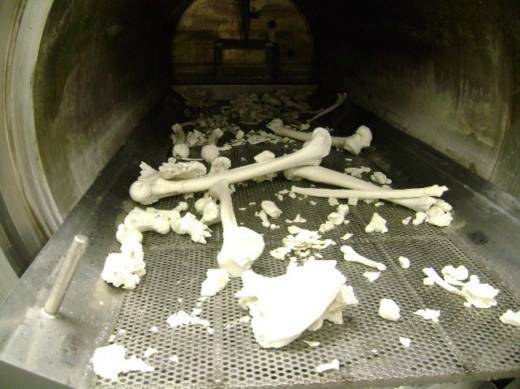 The hatch leads to a dark tunnel where cadavers are heated to 302 degrees and then bathed in 270 gallons of liquid for three to four hours. That's about twice as long as the time required for a fire cremation. The cost varies widely in the U.S., depending on location, but typically, funeral homes charge $150-$500 more for a water cremation than for one done with flames. What's usually left at the end of the process is a tray scattered with clean white bones, and maybe some items of medical hardware. Fisher shows me an example when he opens the door, revealing the remains of a dissolved male body. Some of the metal in these parts can be recycled, and everything left over is sterile. Nothing organic survives during a water cremation. No bacteria — not even a strand of DNA. 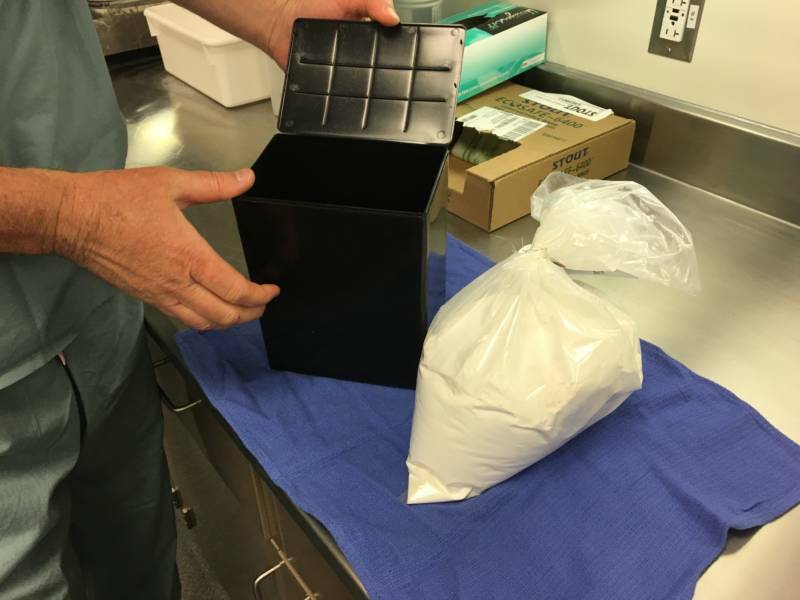 The bones will be pulverized into a white powder that can be placed in an urn, just like the ashes in a traditional cremation. From a cupboard nearby, Fisher holds up a tooth with a mercury filling. The silver molar demonstrates part of why water is more eco-friendly than flame. When you burn a body, the toxic mercury in dental fillings vaporizes and escapes into the air. But water cremation proved a tough sell the last two times legalization was tried in California. There's an inherent ick factor: You’re reducing loved ones to a chemical broth that swirls down the drain. “This just leaves us questioning," said Ned Dolejsi, the executive director of the California Catholic Conference. "Why did part of grandma go to the waste treatment plant?” He says water cremation isn't inherently wrong, but it also doesn’t treat life — or death — with dignity and respect. The proposed bill sailed through the Assembly in June. Now it's before the Senate. If the bill is made law, water cremation will be available in California starting in 2020.